I winced at his comment and thought, “I’m a charity runner.” Boston aside (good luck to everyone registering this week and next! ), I don’t know what runners have against charity runners. They didn’t have to scramble to get in. No, they had to pay the same entrance fee AND raise thousands of dollars for charity. They make the field more crowded. The slots and number of runners in the field are designated by the race, not by the charities. They’re not serious runners. Ahem. I beg to differ. In 2006, my then boyfriend (now husband) re-upped with the United States Marine Corps Reserves in order to take a deployment to Iraq. It would be his second and last deployment to Iraq during is eleven years in the USMC. Back home in New York, I worked, went to school, sent care packages and letters, and tried to occupy the time between phone calls from him. But I wanted to do more. I wanted to do something, contribute something to the military community. Since I had run a few marathons, I decided that the perfect way to honor his service was to run the Marine Corps Marathon. I looked for a charity team whose mission was one that benefitted veterans and their families. It was an easy choice and I joined Team Fisher House and began fundraising for the Fisher House Foundation. I chose TFH because of the Fisher House Foundation mission. Fisher Houses are large houses built near military hospitals all over the country where the families of injured veterans stay for free while their soldier recovers from injuries. They also fly the family to be by their soldiers’ side upon their return to the US. It was a no-brainer for me. If ever I needed their services, God forbid, I wanted to have earned my keep. I raised a lot of money and was very proud to represent TFH at that and four more Marine Corps Marathons and one New Jersey Marathon. My sister, Red, joined me for one of them and that year, together, we raised over $16,000 for TFH. But that first year when I was running while JB was deployed, it was more of a cathartic experience for me. I cried as I ran. I smiled at the newly minted lieutenants from the Officer Candidate School handing out water. I accepted the high-fives from my teammates and strangers who cheered as I ran by. I ran for more than just me. Since then, I have run a dozen or so races of all distances for various charities, all of which held a special significance to me and my family. We are a community, a #RunnerArmy. We are a family. Or, at least, that’s how I see the running community. 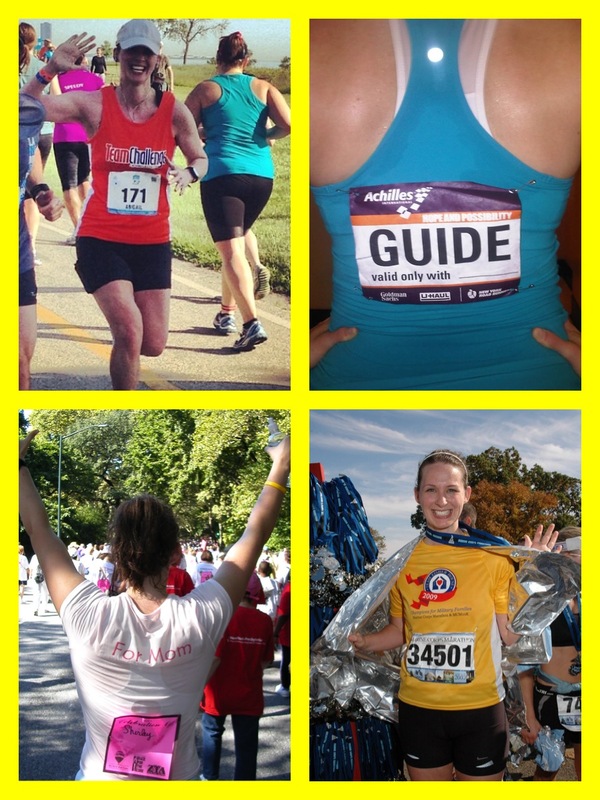 I’m proud to be a runner who sometimes runs for a cause, sometimes my own. The experience of running in honor of someone else was entirely different than running my first race for myself, for my disease. I fought like hell to get to that start line. Next time you’re at a marathon and find yourself judging the charity runners, remember that they’re there running for more. You don’t know. Not all of them joined the charity as a back door into the race. Some of them are like me, running for their Mom, Dad, sister, husband, or even for themselves. Maybe give them a high-five. You can run for me any day of the week and twice on Sunday!! You run for love, hope and charity! It’s too bad that guy made that particular comment. I’m not a big fan of the super big, overly crowded races. But that has nothing to do with that fact that charity runners are there and everything to do with the fact that there are multiple thousand runners there–charity or otherwise. But for someone to pay the fee AND raise lots of money for a good cause? By all means you can join me in a race anytime you want. 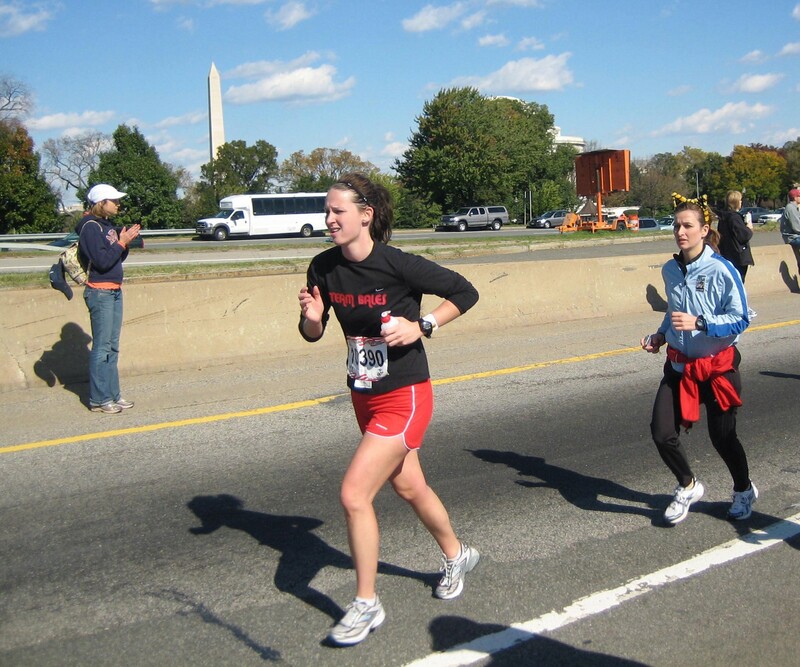 I started running with Team In Training when I decided that I wanted to take on the marathon. I felt that was my best shot at getting a good training plan and it would make it more meaningful since there was a cause behind my marathon. 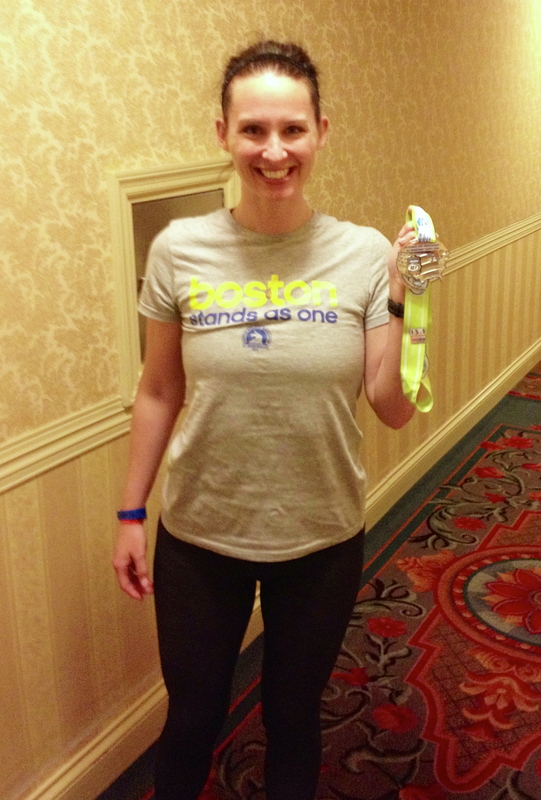 I’ve since done two more events with Team and just submitted my application to run Boston with them next spring. Being a charity runner doesn’t make someone any less of a runner, and the community you become a part of gives you as a runner a greater purpose. Thanks to the charity runners, millions of people have benefited from life-saving treatments that would not have been discovered, underprivileged kids have homes, people in developing countries have food. If you have a problem with that, get over yourself. AWESOME post!!! I run my annual half marathon for Team World Vision every March, and I had the PRIVILEGE of being on their team for the 2011 NYCM. I ran for water, literally and figuratively. (TWV raises funds to provide deep water wells which dispense clean drinking water to uncreached areas in third world countries.) So glad you’ve found charities close to your heart, running for them definitely makes “the run” more meaningful. Fisher House is a great organization. When I was in the military we ran a few food drives to benefit them and make sure their kitchen was always stocked so they had one less thing to worry about. I’ve never run a charity race but I am running my first MCM this year. I’m super excited! Abby- Wow. What a great, well written, heartfelt post! I love your outlook, your approach and most of all your commitment to DO MORE. I miss there were more people with your passion and determination. You and your attitude are welcome on any team I’m on! I came across you while searching for a fellow #CharityMiles user.I don’t know if you’ve used or are familiar with #CharityMiles. If not, give it a look! A little different spin on it. Since I joined up last summer, I’ve logged over 2200 miles for the Michael J. Fox Foundation. Well done, Grove! Team Fox is a great organization. more people need to read your commentary here because it’s spot on. I loathe that people equate charity runners are being somehow less than, like they’re not real athletes, that they didn’t really train, or whatever, because that is just absurd. in fact, I’d wager that ALL of us are “charity runners” at some points in our running careers, and we’re better for it; if nothing else, it keeps us grounded and makes us realize that yes, while our miles do matter, there are far, far greater problems in this world that are in desperate need of a remedy (or two). kudos to you and your ongoing efforts and commitment, Abby! I’m participating in Team Challenge right now. Doing the Las Vegas half will be my second half marathon. I’m super excited for the race, but even more excited that I get to raise funds and awareness for CCFA. I’m in it because of a personal connection and I know others who have done charity races because the cause means a lot to them. Congrats on all the races you’ve done and good luck all in the future! Thanks, Andrea! And thank you for running for TC! Amen! Runners are runners, no matter how fast or slow, we are all part of the family, and I, for one, like being part of a family that often sees they can run for something bigger and better than just a run or a race. My miles won’t bring my grandparents back, but if they can help do research or provide support for cancer patients and their families, count me in. Thank you so much for this. I read your blog all the time but never comment, and I was moved to finally say something after this post. I am running my first marathon this November (ING NYC) and I am doing it with Fred’s Team, for my dad who is battling cancer right now. I often feel undeserving of my spot in the race – like I have to work twice as hard to prove myself, even though I have been running my entire life. Your post reminded me to be proud of myself, to have pride in my goal, and to remember that running for a cause means that my dad will be with me through every mile. Thank you. Good for you Abby! You make a Dad proud with not only your willingness to run and participate in many worthy causes but with your willingness to step forward and speak on behalf of those in need of assistance. Pity the poor misguided fellow that made the comment about “charity runners” and pray that he never needs the assistance of others.